Microneedling is a new, state-of-the-art, medical aesthetic procedure that encourages your skin to revitalize and renew itself naturally. It is an innovative, more affordable and gentler alternative to laser resurfacing treatments and chemical peels. 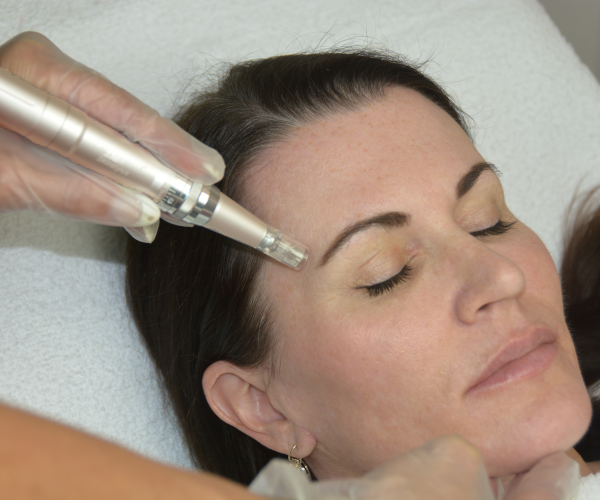 Microneedling achieves smoother and younger looking skin, while virtually eliminating discomfort or downtime. Microneedling stimulates your skin’s natural production of collagen and elastin, reducing the appearance of fine lines, wrinkles, sun spots, scars, and other signs of aging…. on the face or anywhere on the body. Under the careful supervision of Board Certified Plastic Surgeon Dr. Ali, AMAE Med Spa now offers this revolutionary skin rejuvenation process in our Birmingham, MI Med Spa. We use the new, state-of-the-art SkinStylus® MicroSystem. This medical grade microneedling device penetrates deeper than others – with finer, more comfortable needles. Simply put, SkinStylus® offers better results, with less discomfort and no downtime after treatment! Take a look at some SkinStylus® MicroSystem Microneedling Before & After Photos, below. Then schedule an appointment to get smoother, clearer, younger looking skin! This female patient was unhappy with the dark spots and deep creases on her forehead, which she felt added years to her appearance. This before and after photo was taken just 4 weeks after just a single microneedling treatment. You can see, both the lightening of her dark spots as well as the dramatic smoothing of her forehead lines. She looks years younger after just one microneedling treatment. This 54 year old woman looked much older, due to a host of age related skin issues. She wanted to fight the dark spots and loose skin, as well as the marionette lines and wrinkles. The before and after photo was taken 60 days after her microneedling treatment – and the transformation is nothing short of miraculous. Look how much brighter, smoother and tighter her skin looks! This 54 year old woman underwent three microneedling treatments to smooth and reduce the deep crow’s feet around her eyes, that were making her look much older. After just three treatments the deep creases around her eyes were substantially diminished – making her look at least 10 years younger than she did before microneedling. This female patient was unhappy with the red & “pebbly” appearance under eyes, as well as the “marionette lines” that were developing around her mouth. This before and after photo was taken just 4 weeks after her first microneedling treatment. See the dramatic smoothing of the skin around the eyes and around the mouth, as well as an evening of the skin tone. Unfortunately, sun exposure, heredity and aging can all lead to dreaded “age spots” that add years to a person’s face. This 54c year old womans saw a noticeable reduction in her age spots – as well her marionette lines and wrinkles – only 2 months after a single microblading treatment. The microblading also improved the skin’s tone, correcting some of its laxity. This 57 year old female had already seen 3 dermatologists, with no results, before she finally tried microneedling for her vertical hyperpigmentation with horizontal stretch marks. This before and after photo was taken just 14 weeks after microneedling treatment. As you can see, both the dark line extending to her navel, and the stretch marks have virtually disappeared. Top Med Spa Anti-Aging Treatments For Your 50s & 60s Announcing New SkinStylus® Microneedling!